A new robotic surgical navigation system is designed to aid surgeons in performing thoracolumbar minimally invasive and complex spine procedures. The Zimmer Biomet (Warsaw, IN, USA) ROSA ONE Spine system features a robotic arm architecture with six degrees of freedom that can accurately replicate the movements of a human arm, providing high dexterity while completing complex surgical procedures, allowing complete freedom in the choice of trajectories. A full navigation suite of technologies that improve implant and instrument placement accuracy and predictability, combined with advanced haptic capability, help the surgeon easily guide the instruments, while staying within the limits and restrictions established using the 3D intraoperative planning software. Image: The ROSA ONE Spine system in action (Photo courtesy of Zimmer Biomet). The combination of robotic guidance and navigation functionality allow users to establish a seamless and flexible workflow, ensuring they can focus on surgical goals and outcomes. The robotic platform also introduces a novel, real-time patient 'dynamic tracking' functionality that allows the arm to accurately move together with the patient, using information supplied by a non-invasive, touch-free registration system that combines precise robotic movement measurement and non-invasive lasers, without the need for invasive markers or a stereotactic frame. 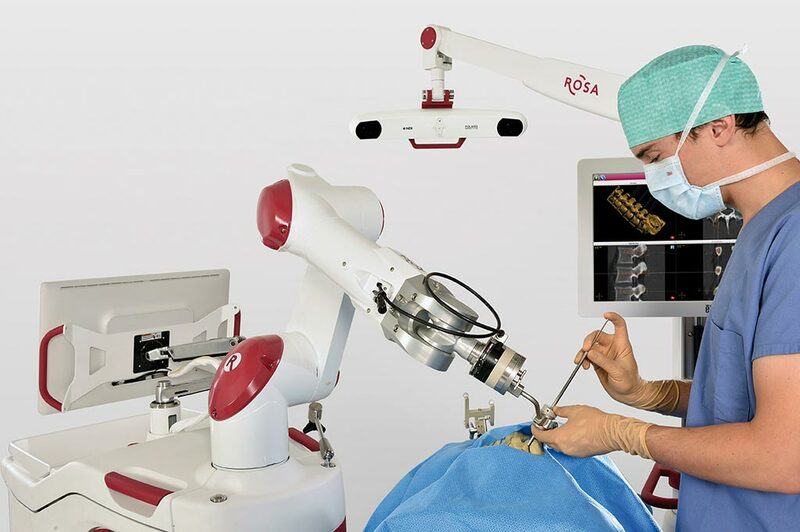 The ROSA ONE Spine System, originally developed by Medtech (Montpellier, France), uses the same platform as the sister ROSA ONE Brain and ROSA Knee system, thus providing a single robotic hardware platform to treat neurosurgical, spinal, and knee pathologies.